You probably don’t need me to tell you, but college is expensive. Very expensive. When you start counting the cost of classes, fees, and obscenely expensive textbooks, a college degree can set you back hundreds of thousands of dollars. And given the current level of economic uncertainty, starting off life with six-digits worth of debt may not be the best move. This week, Georgia Institute of Technology (GIT), in cooperation with AT&T and online educational startup Udacity, made an announcement that could revolutionize higher learning. Starting in the next academic year, the respected college will begin offering an entirely online computer science master’s degree for less than $7,000. Plenty of colleges have offered online courses in the past, but graduates of these are often viewed as lesser than those who attended a brick-and-mortar four-year university. Detractors would be hard pressed to write off a computer science degree from Georgia Tech, though, ranked by U.S. News and World Report as one of the top 10 schools in the country for the discipline. And that’s what makes this collaboration so meaningful – it would cost over $118,000 to earn the exact same master’s degree attending physical courses on the Georgia Tech campus as an out-of-state student. 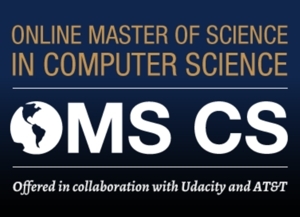 The computer science courses will be offered free of charge through Udacity’s site. To receive credit towards a degree, however, you must be enrolled at Georgia Institute of Technology and pay for the courses.